Hey! Long time no see, haha. Well, I’m almost finished my undergraduate degree! I have 3 finals left and then I’m done! Those four years flew by. I ended up getting my wisdom teeth taken out two weeks ago, so I was really in the market for food that was soft enough for me to eat. These snobby joes really did the trick, and oh. my. god. They were so delicious! 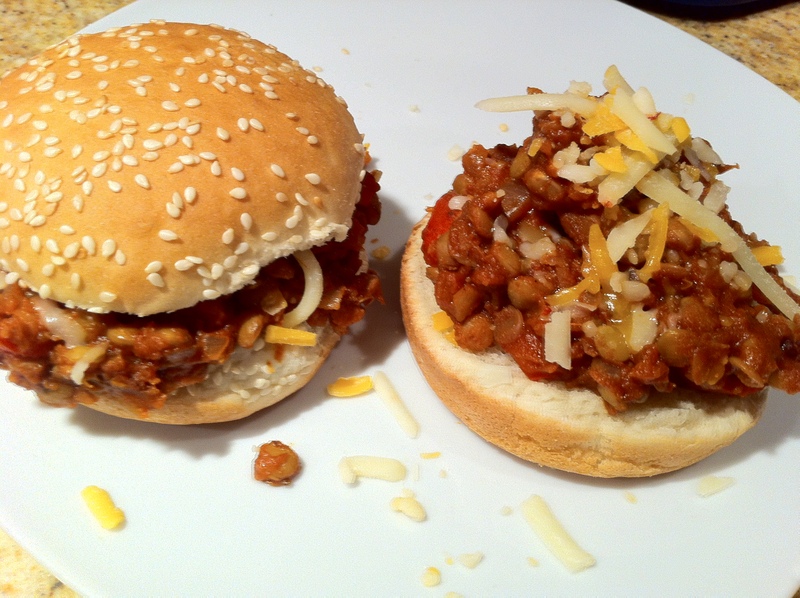 They tasted exactly like sloppy joes, if you didn’t tell anyone that you used lentils they probably wouldn’t realize just based on taste alone (the lentils themselves may give it away). I used the Veganomicon for this recipe, but it’s also available online at the PPK. Put the water and lentils into a pot, cover. Bring to a boil then simmer for 20 minutes or until the lentils are soft. Drain the water and set aside. 10 minutes into the cooking time for the lentils, saute the onion and pepper in olive oil for about 7 minutes or until they’re soft. Add the garlic and saute for another minute. Add the chili powder, oregano, salt and the lentils. After 1 minute, add the tomato sauce and paste. Cook for 10 minutes. After 10 minutes, add the mustard and maple syrup and allow the mixture to heat through. Afterwards, turn the heat off and let it sit for 10 minutes. I pre-soaked my lentils, just to cut down on the cooking time. I also made a few changes (used red pepper instead of green, used more garlic, etc). This recipe was super tasty (and spicy!) so I really enjoyed it. I think some people don’t like lentils because if they’re overcooked they can become mushy but that was fine for me. I kind of wanted them to be mushy so it would be soft! The recipe makes a lot! I know she says it only makes 4 servings, but I think I ended up getting like 8 servings out of this. I find it legumes to be really filling so I don’t eat a lot of them at a time. I have to say, this recipe was just delicious. I was pleasantly surprised by how much it reminded me of sloppy joes made with meat, I was afraid the lentils may give it a different taste/texture but it didn’t! We served this on hamburger buns with some cheese (so not completely vegan).